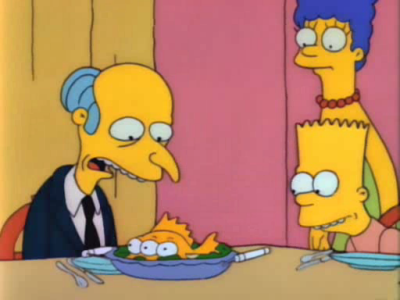 Also recall that after taking a bite of the fish, Burns very dramatically spit it out, and with it, destroyed any chance of his winning the election. This whole issue regarding the comments about women is Trump’s three-eyed fish, and he certainly did spit it pretty far. Meanwhile, on the Democratic side, I make no bones about the fact that I voted for Bernie Sanders in the primary. I agree with many, if not most, of his stances, and he would have made an excellent president, coming from much further left than many modern Democratic candidates. I really became acquainted with Bernie Sanders about nine years ago, when radio host Thom Hartmann would run his weekly “Brunch with Bernie” segment on the radio. There, Hartmann interviewed Sanders, and I liked what I heard, and I really came to respect Sanders for his stances. I also greatly appreciated the fact that Sanders ran an extremely clean campaign. He wouldn’t go negative, and he wouldn’t go on the attack towards his opponents. However, for the general election, I will vote for Hillary Clinton, despite disagreeing with her positions on many things. My thought process is this: even though I live in Maryland, a safe “blue” state, i.e. a state where the Democratic candidate is almost certain to take the electoral votes, I still have to look at myself in the mirror every morning. If Donald Trump somehow pulls this out despite the odds, I don’t know if I could live with myself knowing that I didn’t vote for the major party candidate that I preferred. I’m not going to lie to you: I’ve voted third party on things in the past, and I reserve the right to do it again. But this time, with the modern equivalent of Adolf Hitler running as a Republican, I have to support the Democrat. Progressive talk show host Randi Rhodes put it best in regard to how to vote. You fall in love for the primaries, but for the general election, you fall in line. In other words, when it’s primary time, vote for your favorite candidate. So I voted for Bernie Sanders, my favorite candidate. But now the primaries are over. Bernie Sanders is no longer running for president. Time to fall in line, i.e. come together and support the nominee, because while Hillary Clinton is definitely not the candidate that I fell in love with in the primaries, her views are far closer to mine than those of Donald Trump. Meanwhile, when it comes to third party candidates like Libertarian Party candidate Gary Johnson and Green Party candidate Jill Stein, I have mixed views. I believe that both Johnson and Stein both thoroughly destroyed their credibility over the course of their respective campaigns. I do see Johnson as having a real chance of picking up a few electoral votes, though, for the simple reason that he is a former Republican who is not named Donald Trump. In any case, I look at third party candidacies with a certain level of “get serious”. These are people who are not running for office, but running to make a point. The chances of a third party candidate’s actually winning this election are exactly zero. If you are an independent politician and are running for president to actually win, then you run in the major party’s process. You may still not win, but it shows that you are at least somewhat serious about winning. However, I do suspect that many of the people that run for president are not really seeking public office so much as they are running for book deals and pundit jobs. Pretty sure that Herman Cain was running for a pundit job in 2012, and apparently he was successful, taking over Neal Boortz’s radio talk show. But the whole idea of independent candidates running in the major parties’ primaries is why I have tremendous respect for Bernie Sanders and how he handled his candidacy. For those not familiar, Sanders, historically, has run as an independent. But rather than run a third-party campaign, and thus act as a spoiler, opening the door for a Republican presidency (after all, Ralph Nader is a big reason why George W. Bush became our 43rd president), Sanders ran as a Democrat, which is the major party that he is most closely aligned with, ideologically. Clearly, he was in it to win it, and not just to make a point. In addition, once the primaries ended and he didn’t get the nomination, he stood down, and threw his support behind Hillary Clinton. Compare to Jill Stein, who practically begged Bernie Sanders to become a spoiler candidate. That act was one more reason why Jill Stein and the Green Party should not be taken seriously at the national level. However, for those of you who still really want to vote third party for whatever reason, if you’re in a safe state, red or blue, go for it. Vote third party all you want. If you’re in a swing state, i.e. Colorado, Florida, Iowa, Michigan, Nevada, New Hampshire, North Carolina, Ohio, Pennsylvania, Virginia, and Wisconsin, you need to pick one of the major party candidates, because that’s where it matters most. That is where it will really determine whether we get a Clinton or a Trump presidency. That’s where Gary Johnson and Jill Stein can really spoil an election, and help elect the candidate with the philosophy most opposite of what their candidacies stand for. Thus how we ended up with George W. Bush, after all – thank you, Ralph Nader. After all, it’s really 51 separate state elections that feed into the electoral college that makes a president (I wrote about how this all works in this space in 2013). Thus a few votes in one state can turn the result that the entire country has to live with for four to eight years. Speaking of swing states, looking at how some states have such an effect on the contest vs. others, I have joked that we as a country could save a whole lot of money and effort by just letting Ohio pick the president for us. After all, since 1896, Ohio has picked the winner in every election, with only two exceptions: 1944 and 1960. Save the rest of us the headache and let them do it for us. And lastly, please don’t forget about your downticket races. Everyone in the United States (other than DC) has one congressperson and two senators. You should always know who these people are. Your congressperson is up for election every two years, i.e. he or she is up this year. You may or may not have a senator up for a vote this year, since they serve staggered six-year terms. Then even further down the ticket, with your local races, you really need to research the issues there. After all, the lower down the ticket that the race is, the more directly it will affect your life. President and all of that is great, but he or she is not an autocrat. We have multiple levels of government and lots of people with their hands on different buttons. And they all matter in some way, including dogcatcher. So there you have it, I suppose. My thoughts about the 2016 election. Now all you have to do now is go vote.